Cherry Mobile launches today the S7 series Android smartphones at SM Cyberzone in SM North EDSA Annex. A few days ago, they revealed 3 devices under this series, but it turns there are 5 more, one of which is the Cherry Mobile Flare S7 Power. The Cherry Mobile Flare S7 Power as the name implies, it has a huge 5000mAh battery for long lasting up time. But, it is not just about having a big power pack, it also has a rare feature, that is the triple SIM slot!! Moving on, it has a 5.45-inch Trueview display that has 18:9 aspect ratio. Under the hood, it got 1.3GHz quad core processor couple with 1GB of RAM, 8GB of expandable storage, and runs on Android Oreo Go Edition. Camera wise, there's a total of 4 modules installed, an 8MP + 2MP on the back, and 5MP + 2MP in the front. 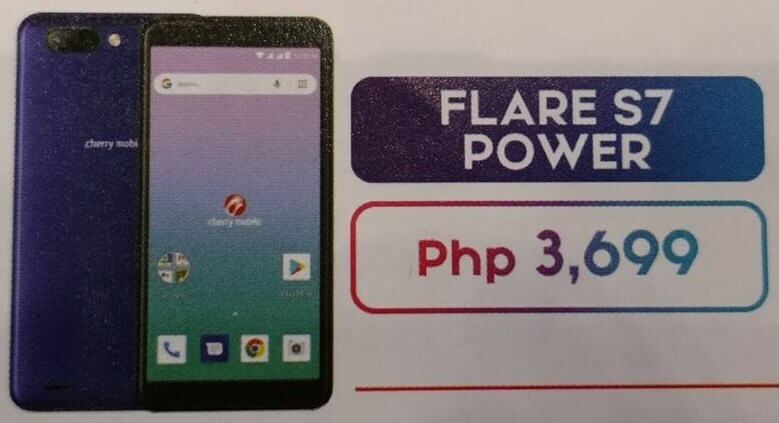 It has a retail price tag of Php3,699 and will be available sometime this month. What do you think guys? Yay or Nay?